The terminal sulcus which is a V-shaped groove separates the human tongue into anterior and posterior parts. The foramen cecum is a covered foramen, which is the residue of median thyroid diverticulum at initial embryonic development and indicates the top of the terminal sulcus. The thyroglossal duct indicates the path of migration of the thyroid gland towards its final location in an adult and the foramen cecum of the tongue shows the site of origin. 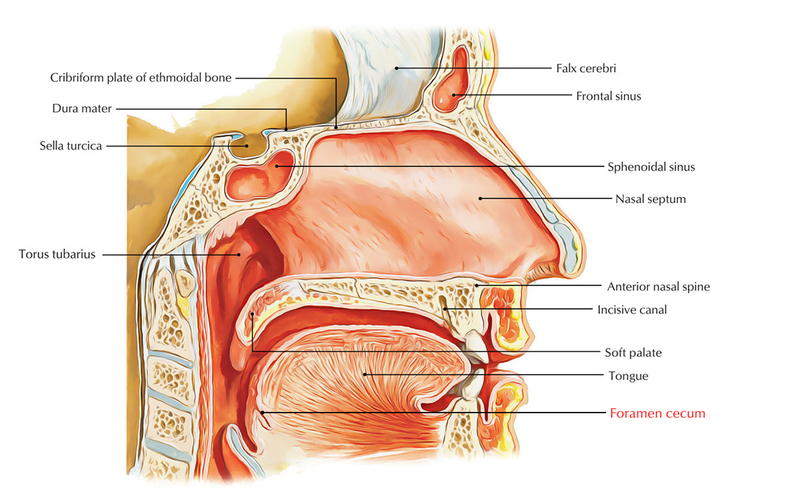 The thyroglossal duct generally disappears during early growth; however traces may proceed as a cyst or, namely, a fistula, as a connection towards the foramen cecum.